Opening Reception September 22. 6 p.m.
21 Charter Oak Avenue, Hartford CT 06106 | (860-310-2586). Traversing Traditions / India is a month-long celebration of Indian music, visual arts, dance and film. High-caliber performing artists will present both traditional and contemporary classical music and dances of India. The visual and media arts segments redefine notions of the “contemporary” through an amalgamation of traditional, indigenous, popular, and current art practice by both Indian and Western artists. Taken as a whole, Traversing Traditions / India explores the interconnected nature of India’s arts. The program was co-curated by Kathryn Myers and Rachna Agrawal. The series will kick off with an opening reception in the Charter Oak Gallery to celebrate the visual arts exhibition on September 22. The exhibition will include folk and tribal art, ceramics, block printing, textiles, embroidery and miniature painting. Artists include: Santosh Kumar Das, Chotsani Elaine Dean, Alexander Gorlizki, Shelly Jyoti, Saroj Venkat Shyam, Venkat Singh Shyam, Jacqueline Metheny, and Robert Kirschbaum. Kirschbaum is showing a mixed media sculpture/installation relating to the Akedah. The image above is one of the components of Kirschbaum’s piece. 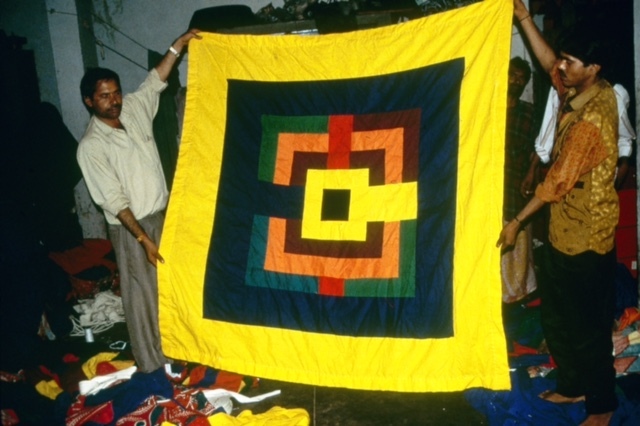 It depicts a cloth panel he designed and had constructed in India at a tent-making (shamiana) factory. It, and at least one other cloth panel, hung from the ceiling, will form an environment surrounding the rest of the piece, which will include two small polished bronze (baby) feet embedded in ash. Dance, music, and film events follow throughout the month of October.